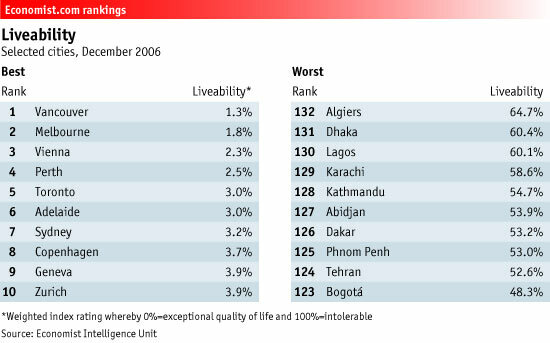 The Economist Magazine has just published the highlights of The Economist Intelligence Unit’s Liveability Ranking as part of the Worldwide Cost of Living Survey :Where the grass is greener: Cities in Australia and Canada are rated the most liveable in the world, and out of 123 worldwide cities, Vancouver came in First (Yeah!!!) and Toronto came is Fifth (!!). Another nice feather in Toronto’s and Canada’s hat. Fast, Creative and now “Liveable”. We knew this, but where just having too much fun to tell anyone. This entry was posted in Canada, Toronto by Ian. Bookmark the permalink. Next → Next post: Dilbert is listening to My conference calls..